The crater Llanesco based on THEMIS day-time image. 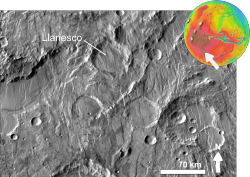 Llanesco is a Martian impact crater, 27 kilometers in diameter. It is located at 28.5S, 101.2°W, north of the crater Dinorwic. It is named after a town in Spain, and its name was approved by the International Astronomical Union in 1991. According to a surface age map of Mars based on US Geological Survey data, the area around Llanesco is from the Noachian or Hesperian epoch, which places the area's age at 3.8 to 1.8 billion years. The crater's rim averages about 7,750 meters above zero altitude, and its floor averages about 7,000 meters above zero altitude. The crater is therefore approximately only 750 meters deep. Wikimedia Commons has media related to Llanesco (Martian crater). ^ "USGS Astro: Planetary Nomenclature: Feature Data Search Results". USGS Gazetteer of Planetary Nomenclature Feature Information. Retrieved October 23, 2007. ^ a b NASA World Wind 1.4. NASA Ames Research Center, 2007. ^ "INTEGRATING GLOBAL-SCALE MISSION DATASETS – UNDERSTANDING THE MARTIAN CRUST" (PDF). lpi.usra.edu. Retrieved October 23, 2007. This page was last edited on 28 February 2019, at 17:19 (UTC).